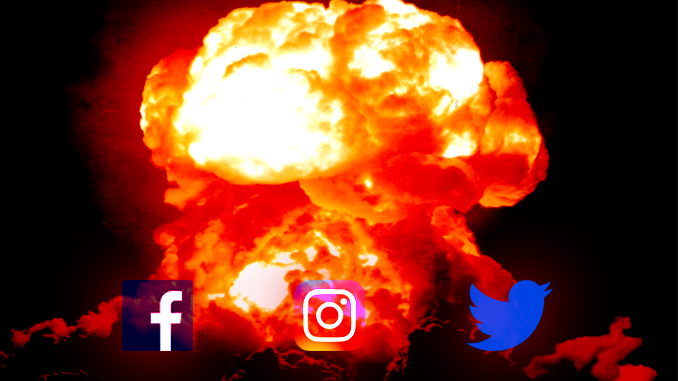 Social media Nuclear Explosion. Image by Lenny Ghoul. About five years ago, I was talking with my dad about the huge advances in technology. As is a frequent part of such discussions, he was lamenting about how useless smartphones are. Of course, he was focused on all of the kids with their noses constantly in them. He honestly believed that there are absolutely no good uses for them. I tried to explain that there are many legitimately good uses for them, but he wasn’t buying any of it. One thing we did agree on is that social media has more negative aspects to it than positive. In this discussion, I was way more critical than even he was. He thought people just wasted their time on it with meaningless, trivial stuff. But my point was a little more dire. I then explained to him why I thought that social media was likely going to ultimately prove to cause the end of the world. Yes, the end of the world. Memes are a way to send specific “talking point/bumper sticker” messages to millions of viewers. The majority of the time, these memes present a highly skewed, biased piece of information, or often an outright lie. They are often presented in a humorous manner in order to gain more attention. For many people who otherwise do not seek out quality information in any way, they develop all of their political thoughts and positions based on such drivel. There’s really no limit, no cost, and no accountability for these, yet they reach millions of people every minute of every hour of every day. We all, at this point, understand how the Russians used a very sophisticated disinformation campaign on social media to incite division and unrest among the American electorate. Well, that is, it’s clear to all of us except the President of the United States. This sort of use of social media goes right along with the use of memes as described above. But it went even further. It created groups that then went on to organize protests and demonstrations and rallies, each of which were very carefully targeted to achieve the Russian’s objective. Social media has opened up a whole new way to create instant outrage. Because everyone is capturing everything on video and photos with their smartphones, they can instantly share them on social media, and if the clip is worthy of outrage, whether warranted in full context or not, it will quickly go viral. Seeing only limited clips of something is never a good way to get a full understanding of what happened. We’ve seen it over and over with police shootings and other altercations, with protesters, and with politicians making statements on various topics. We get a brief video segment that does not include what happened before and/or after the segment, so there is no way for us to really know what happened. Yet, we tend to form instant opinions based on that brief glimpse. The latest, of course, is the video of the Catholic school boys and the Native American veteran. At the beginning, we saw a brief video segment that suggested the boys had been solely at fault in their aggressive mocking and surrounding of the Native American. It was nearly unanimous in the condemnation of the boys. But is was all based on very limited knowledge of the full context of the event. As more video became available, the context began to be filled in…there were more bad actors in the situation and the story was completely different as we became aware of more information. It’s beyond the scope of this editorial to get into the details and try to assess who is to blame and who was in the wrong in the whole situation, but it is clear that very brief video of something is all it takes for people to draw conclusions and begin the process of condemning and fighting for their side. Even when additional information comes to light, it’s often too late…people have made up their minds already. Social media is the perfect platform for demagogues. Those who created our Constitutional system put a lot of thought into creating a system that would prevent, as best as possible, demagogues from reaching the highest pillars of government. This was a huge issue in their minds and was a big reason for the Electoral College system of electing the President. Social media alone would not be so bad if we had stuck with the plan that was so carefully crafted. However, when you combine the destruction of our systems created to protect against demagoguery with social media, then things are ripe for disaster and we end up with a “binary choice” between the two worst possible candidates we can imagine. Ignorance is what causes all of the problems above. However, social media also increases the ignorance even more. People believe they are getting all of the information they need through social media and then believe there is no need to look further to seek out the full truth of each issue. Ignorance begets more ignorance. Ok, Steve, so how does all of this result in the end of the world?? Because when you put all of this together, it is the perfect recipe to put the final nails in the coffin of our great American Experiment. The final remnants of our Constitutional system, so carefully crafted by the genius of our founders, will unravel. For example, what’s the next thing? Instead of returning back to the Electoral College system that protects against demagogues and foreign influence at the highest levels of government, social media is being used to completely do away with it. None other than our own President uses Twitter to push such dangerous nonsense. The members of Congress are afraid to challenge the President on anything because they are afraid to be targeted by the President on social media, which would make their reelection very difficult. Congress is also negligent in performing their Constitutionally mandated duties under the separation of powers concept, which destroys the foundation of our system. Even today we have Senators stating they will not vote on certain bills unless the President gives the go-ahead. That is not how our system operates. In fact, allowing one man so much power is contrary to our entire system. If our exceptional Constitutional system collapses completely, we will lose our exceptional Republic. And if that happens, the world will be thrust into a chaos never seen before, resulting in…you guessed it…the end of the world. Well, that’s my theory, anyway. Consider that the next time you post or receive a meme on Facebook or Twitter. Consider that the next time we are presented with video clips that do not provide full context. Consider that every time we view an immature, ignorant, dishonest tweet from the President…and consider how many people are liking and retweeting it.